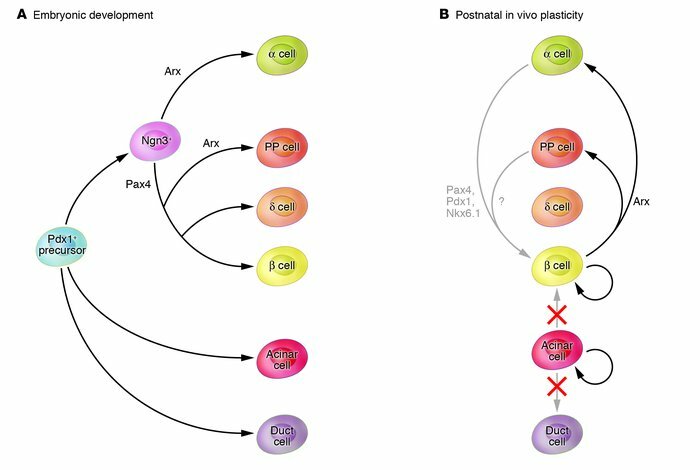 Lineage relationships and plasticity of the embryonic and adult pancreas. (A) All differentiated pancreatic epithelial lineages are derived from Pdx1+ precursor cells of the early embryonic pancreas. A subset of Pdx1+ precursors expressing Ngn3 become committed to the endocrine lineage. The transcription factors Pax4 and Arx further specify β versus α endocrine cells. (B) Given the shared developmental origin, several studies have addressed the possible interconversion of adult pancreatic lineages. For example, in vitro studies indicate that acinar cells can be differentiated into ductal or insulin-producing cells (10, 11). In this issue of the JCI, Desai et al. (9) have now demonstrated that during regeneration of the pancreas, acinar cells proliferate but do not give rise to β cells or duct cells. Together with an earlier study showing that adult β cells are largely derived from preexisting β cells (8), these findings suggest that in vivo, the plasticity of differentiated pancreatic cells is very limited. However, another study in this issue of the JCI (13) provides a clear example of pancreatic cell plasticity in vivo, showing that inducible misexpression of the transcription factor Arx in adult mature β cells causes transdifferentiation into α and PP endocrine cells. This illustrates how knowledge of developmental transcriptional mechanisms can be exploited to change cellular fates in the adult pancreas. It is conceivable, for example, that misexpression of pro–β cell specification factors such as Pax4 might be employed to generate β cells from α cells. Nkx6.1, NK6 transcription factor related, locus 1.